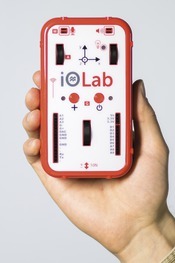 IOLab is a handheld data-gathering device that communicates wirelessly to its software, and gives students a unique opportunity to see the concepts of physics in action. Students gain hands-on experience and watch their data graphed in real time. This can happen anywhere you have an IOLab device and a laptop: in the lab, in the classroom, in the dorm room, or in your basement. IOLab is flexible and makes it easy for instructors to design and implement virtually any experiment they want to assign their students or demonstrate in lecture.